Casa Samba is the perfect tropical escape villa. This 5-bedrooms, 5-bathrooms villa was built into a bluff, overlooking the rainforest with vast Pacific Ocean views near Playa Espadilla white sand beach. It is in the exclusive cobblestoned neighborhood on Pacific Canyon Drive, private, but easily accessible to the local markets, restaurants, spas and the Manual Antonio National Park. The villa’s multi-level living spaces all open to ocean breezes and tropical gardens with exotic sounds and scents from the local flora and fauna. This is not the typical vacation villa that was hastily built to get a quick flip. The owner lived in Casa Samba with his family, sparing no details to make this an original and exquisitely designed Balinese style home. Includes cathedral bamboo open beam ceilings, hand-carved stone and glazed earthenware custom sinks, custom stonework and tile, exotic hardwoods and original art from around the world. -	270-degree view of the Pacific Ocean and Manuel Antonio National Park. Manuel Antonio is a great place for Shopping, touring the local restaurants and all around is a safe place to be. Amazing beach view of Manuel Antonio. 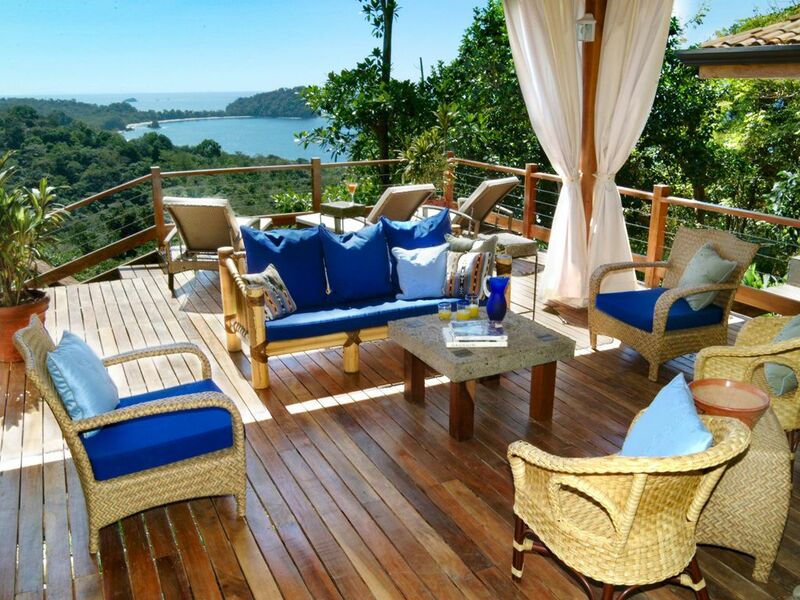 The Casa Samba has a multi-level view of the Manuel Antonio Coast. You will see the amazing ocean and beach views right from your room. Kitchen is fully implemented. This homes offers a special weekly chef rate of $500 if booked at time of renting the home. This would be for 2 meals a day, cost of food is addiitonal. A full 18-hole golf course is at a 1 hour drive. Ask your host for details. Swimming pool, Pool Table, TV, DVD/CD Player, Stereo, Grill, Huge Terrycloth Bathrobes, 100% Cotton Linens (350 count), Magnificent Views, Air Conditioning in bedrooms, Terraces, Tropical Gardens, Daily Housekeeper, Gardener, Laundry Service available, Concierge, Pack and Play, High Chair, In-Room Safes, Refrigerator, Microwave, Blender, Coffeemaker, Dishwasher, Toaster, Oven, Full Kitchenware.